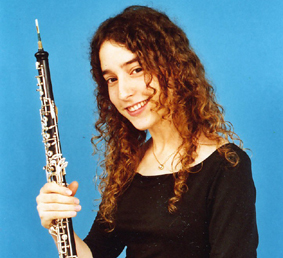 Tamar Inbar, oboe, studied with Dudu Carmel at the Jerusalem Music academy where she won the competition for solo performance with orchestra and got full marks for her final oboe exam. She continued her studies with Maurice Bourgue in Geneva and finished her diploma with Thomas Indermuhle in Karlsruhe, and was awarded high honours. She finished her Masters studies with Stefan Schilli at the Mozarteum Salzburg, also with high honours. She has participated in master classes with Stefan Schilli, Jacques Tys, Christien Schmidt, and Alfredo Bernardini. She performed as a soloist with the National Symphony Orchestra of China, the Kuopio Symphony Orchestra in Finland, the Rishon LeZion Symphony Orchestra, the Beer Sheva Sinfonietta, the Israel Chamber Orchestra, and the Tel-Aviv Soloists Ensemble. From 2001 to 2002 she held the position of principal solo oboe of the Rishon Le Zion Symphony Orchestra (The New Israeli Opera Orchestra). From 2008 to 2009 she was solo oboe of the Mozarteum Orchester Salzburg. Tamar plays regularly as solo oboe of the Tel-Aviv Soloist Ensemble. She played as substitute solo oboe for the Symphonieorchester des Bayerischen Rundfunks, the Bayerische Staatsoper, the Münchner Rundfunkorchester, the Oper Frankfurt, the Israel Philharmonic Orchestra, the Helsinki Philharmonic Orchestra, the Camerata Salzburg, the Münchner Kammerorchester, and the Jerusalem Radio Symphony Orchestra. She took part in the Helsinki Philharmonic Orchestra tour to Scandinavia and London (BBC Proms) under the baton of Esa-Pekka Salonen, and the Jerusalem Radio Symphony Orchestra tour to Spain and America (Carnegie Hall) under the baton of Lawrence Foster. She took part in the West-Eastern Divan Orchestra conducted by Daniel Barenboim in Europe, America and the Middle-East. As a chamber musician she has worked with the Jerusalem International Chamber Music Festival, the Israel Festival, the Voice of Music Festival in the Upper Galilee, the Usedomer Musikfestival and “Kamari 21” in Helsinki. She recorded live for the Israel Radio.